Berwyn, PA (Philadelphia) April 30, 2017 - Career Solutions Publishing, the soft skills and career readiness publisher, today announced compliance of its Job Ready Career Skills software with LTI protocol for LMS systems. The Career Solutions Publishing team works with schools, districts, counties, states and other educational entities to address their LMS questions and concerns. Those interested in learning more may contact Career Solutions Publishing at 888 299-2784 or csp@careersolutionspublishing.com. This entry was posted in Announcements on April 30, 2017 by Career Solutions Publishing. Berwyn, PA (Philadelphia) April 28, 2017 - Career Solutions Publishing, the soft skills and career readiness publisher, will be travelling this summer to present and exhibit at CTE and special education conferences across the country. Educators are invited to attend one of the professional development sessions or software demonstrations to learn about trends, updates, and employer expectations in the workplace readiness arena. Several conferences and dates are listed below. Additional conferences will be posted throughout the summer. The Career Solutions Publishing staff looks forward to hearing from educators with recommendations for future products, ideas to share, or questions to be answered about the company's current curriculum products. This entry was posted in Conferences on April 28, 2017 by Career Solutions Publishing. Berwyn, PA (Philadelphia) April 25, 2017 - Career Solutions Publishing continued to grow its work readiness outreach to transition programs by exhibiting at the Council for Exceptional Children (CEC) Expo in Boston April 18-21. As federal and state laws focus on readiness for work for special education students, transition programs turn to Career Solutions Publishing for soft skills, work ethics, and job readiness materials that center on customer service, relationships with coworkers, effective work behaviors, communication, money management, and blended academics and career content. 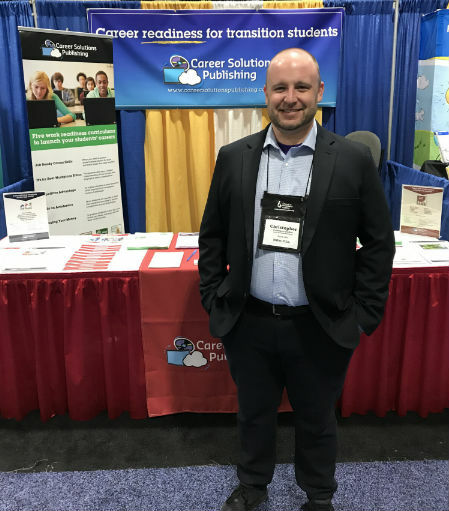 Teachers at the CEC conference were especially interested in practical materials for their autism students moving toward employment, according to Christopher Needles, Career Solutions Publishing technical support specialist shown here at the company's exhibit booth. Career Solutions Publishing software delivers relevant work readiness training and also identifies students' knowledge across a wide variety of work-related topics employers insist are essential. The teacher-friendly, online measurement tools of The Teacher's Desktop that comes with the online version of materials shortcuts the teacher's time spent in grading and record keeping. This entry was posted in Conferences on April 25, 2017 by Career Solutions Publishing.